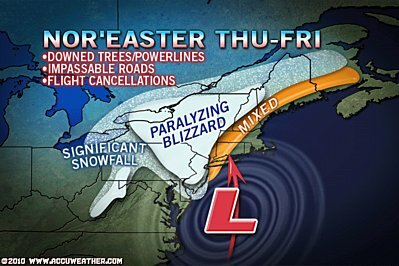 Accuweather: Weather bomb for the Northeast? this may be the one that people remember the most this winter in parts of New England and the northern mid-Atlantic. At its peak, the storm will deliver near hurricane-force wind gusts (74 mph) blinding snow falling at the rate of over an inch per hour. For some people in upstate New York and eastern and northern Pennsylvania, this may seem more like a “snow hurricane” rather than a blizzard. The storm also deliver heavy rain and flooding northeast of the center of circulation. The cities of Boston, Providence and Portland may have their hands full with coastal flooding problems. The combination of wind, heavy rain and heavy snow will lead to extensive power outages and property damage. Where numerous trees and lines are blown down, the power could be out for a week in some areas. blocked by snow, downed trees or flooding. Blowout tides caused by strong offshore winds from New Jersey to North Carolina may pose problems for coastal waterway interests. get all snow, all rain, snow to rain or just snow showers. A variance in track of as little as 50 miles will make a difference. One thing is for sure, most people in the mid-Atlantic and New England will have problems from this storm’s strong winds. Keep checking in at AccuWeather.com for updates on snowfall and other impacts on this potentially very dangerous, destructive storm. My thoughts about the monster storm Thursday into Friday, though the worst conditions will be Thursday and Thursday night. –Computer models all show a huge storm, but differ slightly on the track and amount of warming coming westward off the ocean. –This will intensify rapidly Thursday morning along the Middle Atlantic coast, then get drawn northwestward into New Jersey Thursday afternoon and evening, before turning south then east into Friday as it completes loop. –Big blocking high pressure over Atlantic Canada will trap the storm over New England through early Saturday, but it will peak in intensity Thursday night, then slowly weaken Friday and Saturday as colder and drier air gets wrapped around the large circulation. –There will be three main areas of strongest winds (Gusts to 60 mph or 95 kmh) Thursday and Thursday night. The first area will be from central and southern Pennsylvania to the Delmarva Peninsula with northwest to west winds. The second area will be along Long Island and out toward Cape Cod with south to southeast winds. The third area will be along the Maine coast and out across the southern half of Nova Scotia with easterly winds. –The combination of heavy rain, a saturated ground, melted snow could lead to flooding problems from southern New England to eastern Maine and Nova Scotia. –For snow lovers, what concerns me over the Hudson Valley, Montreal region and into northern new England is the fact that this large circulation will no doubt draw in mild air off the ocean, so there will be a change to rain in many of these areas for a time Thursday, especially in the valleys, which will limit snowfall accumulations. I could even see the snow mixing as far north and west as Binghamton, Utica and Syracuse, NY for a short time on Thursday, but that would be about it. –A potential dry slot (area where the precipitation temporarily shuts down) is also another fly in the ointment Thursday afternoon and evening across interior New England and perhaps the Hudson Valley. –This is going to be a big time snowstorm or blizzard for parts of upstate New York and northern/northeastern PA in my opinion, with amounts reaching 2 feet. I think there will be three areas where we could see these amounts…..1. northern Poconos/Catskills region. 2. Adirondacks. 3. Areas due south and southeast of Lake Ontario in western New York. Northern Pennsylvania, north of Williamsport should get dumped on as well. The Laurel Mountains of western PA will have at least 3 days of accumulating snow with the northwest wind blowing. –I believe a heavier band of snow will rotate all the way northwest and west Thursday afternoon, Thursday night and early Friday, reaching Ottawa, Peterborough and close to Toronto, maybe just a tad east. Under that band we could see blizzard conditions. The Niagara region should also get in on the heavier snow for a time Thursday night into Friday with the strong winds coming in off the west end of Lake Ontario. –I believe a band of heavier snow will shift into northern New Brunswick Thursday night and Friday. A mix of rain and snow over central and southern New Brunswick. –The placement of the storm center over New Jersey argues against heavy snow in New York City and surrounding suburbs, but northwest NJ/western NJ may not be as lucky. Close call. –There is the potential for backlash (wrap around) heavier snow similar to one of the earlier big storms over southeastern PA/extreme NE Maryland and Delaware Thursday afternoon and evening. The combination of wind and snow could make the drive home from work a difficult one at best.